Now nothing can stop the development pace of 360°VR video since it has gone viral over YouTube, Facebook and more video sharing sites. Just because of this, users feel more curious about this rising star VR video when it comes to upload 360 degree video to YouTube and Facebook. What is the video format for 360 video? Is the 360 media file format compatible with YouTube and Facebook? What formats are supported by VR headsets? Well, this following post will give your all the answers you need. What is 360 Degree VR Video? 360° video is produced by different 360 degree camera, mounts, gear, mostly 6 fish-eye-cameras to cover the entire area. And after the recorded videos being synchronized by time and sound, it enables users to watch the video from 6 angles, the front, back, left, right, up and down at once. You can shift the video watching angles at your own will. 360 degree video is also named immersive videos, spherical videos or equirectangular videos, designed to give you experience with every direction to be viewed via personal computers or mobile devices. You can even view the 360-degree videos in an immersive format similar to virtual reality with your VR headsets such as the Oculus Rift, Samsung Gear VR. After a brief understanding about what is 360 degree video, let's cut to the chase - best 360 degree VR video format. In most cases, the 360 degree VR video is saved as .mp4 or .mkv. If you've ever play VR 360 degree videos on YouTube or Facebook, you will be familiar with the two container formats. Besides, you can also watch 4K 360 video online with flash video format like FLV, WebM, MPEG, etc. More often than that, a short standard 360 degree video maintains its file size around 120-300 MB and can be watched within certain seconds for video buffering. For a higher resolution video, the size of the file is significantly larger of course, e.g., the 4K 360 Virtual Reality video definitely needs more time for buffering. So if you wanna watch 4K VR video with no wait, it's suggested to compress 4K 360 videos or download 4K 360 VR video for offline watching without the annoying buffering. Speaking of audio for VR, the most familiar audio effects are spatial sound, binaural, ambisonic and 3D. Here I don't wanna confuse you to understand such professional words. Instead, I will illustrate them in plain expressions. You can free change the video angle of 360 video and at the same time you may have the doubt: will the video sound change accordingly? Yes, that's why the 360 degree video spatial audio comes into exist. When the space and angle of 360 VR video has changed, the VR audio will accordingly adjust audio saturation level, sound intensity, distance, the depth of sound, etc. (VR audio mixes feature) to let you listen as you do in real life. And the rendering engine ensures that the audio is in sync with the video, irrespective of the video playback mechanism. 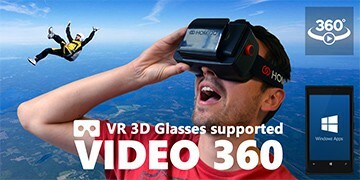 Watching 360 degree VR video is the first step to be acquainted with 360 degree 3D virtual reality video. To make your own 360 video is the second step you need to know more about it. And the final step is to upload 360 degree video to YouTube or Facebook to share it with the global village. And if you think the last step equals the highest degree of difficulty. Then I tell you the truth: it's not that kind of hardship once you get the best 360 video settings and video format for YouTube and Facebook upload. After you finish your own DIY 360 degree VR video but sorry to find it's formatted with the video format YouTube and Facebook not supported, you can apply the best-ever 360 VR video converter to convert and compress video to MP4, AVI, FLV, etc. container format with much smaller file size and highest quality possible reserved via its video compression engine or video editing feature (trim, crop, etc.) to shrink 360 degree video file size for smooth YTB/FB uploading. To free download and convert 4K 360 degree video or even higher 8K 360 video, MacX Video Converter Pro can be your best option. Without further ado, it can independently free download 4K 360 VR or 8K 360 video in 3D or 2D from YouTube, Facebook, etc. 300+ video sharing sites in mins (Intel QSV hardware acceleration supports). And it also amazes you at its powerful video compression knack to convert and compress 8K 360 to 4K 360 or 4K 360°video to 2K 360 with much smaller file size and highest quality for easier YouTube/FB uploading or 360 video playback with VR 360 player. Follow the steps below to convert the video into the best format suitable for uploading to YouTube or viewing with the VR headsets. Prior to the steps, please Free download the 360 video format converter on your Windows computer (Win 10 included) or Mac version, install it on your specific platform. Step 1: Launch this VR 360 file format converter. Then add the 360° virtual reality video by clicking "Add Files" button. Step 2: Choose the output format. Since the most commonly used 360 media format is MP4, we suggest you to go to PC general profile and choose MP4 H.264 or MPEG4 as the output format as it maintains the best video quality and file size. Step 3: Specify the output folder by clicking "Browse" button. Then hit "RUN" button to start the short process of virtual reality 360 degree video conversion. Then the converted 360 VR video will be the best format that can be recognized by your VR headset, player or uploaded to YouTube. Best video downloader for Mac? Which one is the champion? Here compares top three free Mac video downloaders, from which you can pick out the best video downloader to download video free on Mac. Is YouTube 360 video download achievable? Certainly! Learn how to download 360 degree video from YouTube on your computer, following the ultimate but simple guide to 360 VR video download. 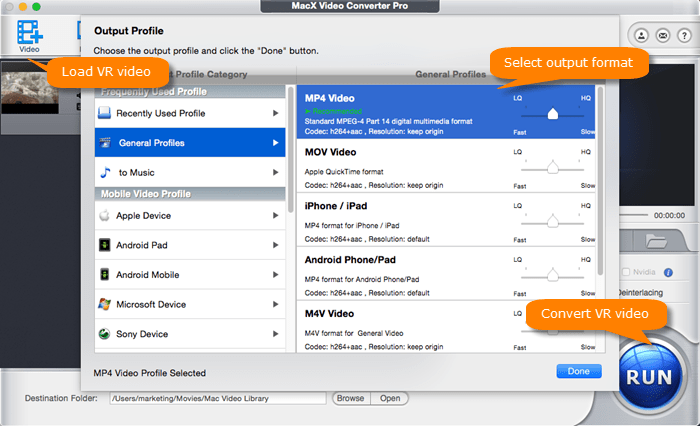 MacX Video Converter Pro is a full-featured, high quality, and remarkable HD/4K 360 VR video downloader & converter. After downloading, you can freely compress and convert the downloaded 4K VR video to Mac/PC iPhone iPad and Android.